Christmas in Span is a completely different story to the one in England or in Hungary. Here the limelight is stolen away from poor Santa. Children know about him but he’s not important at all. The protagonists (yes, there are more than one!) are the Three Wise Man or Los Reyes Magos de Oriente as they are known here. They have magic power hence the ‘wizard’ in their names and they are the ones who bring presents to the children. They however don’t come on Christmas but on January the 5th. Therefore in Spain the celebrations are extended to the new year. 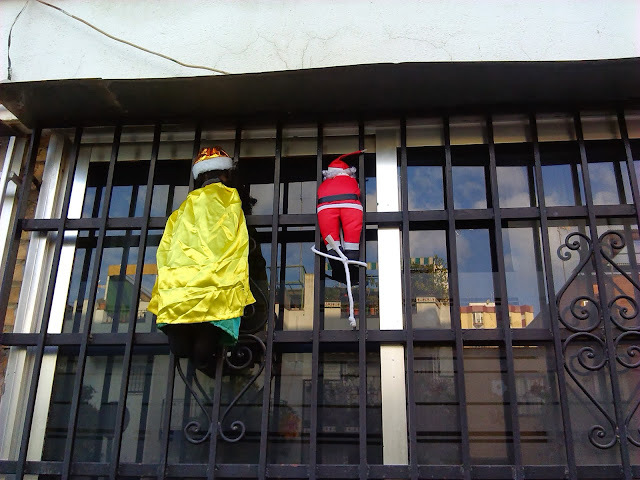 Even though you can see some commercialized Santa (or Papa Noel in Spanish) decorations the ones who climb up to the windows are the Kings. Seems like there are some who don't want to chance it. And who else would the children write their Christmas letter to than the Three Wizard Kings?